For everyone keeping score at home, this July (the 13th to be precise), will mark 10 years since I lost the top half of my left lung to a rare type of tumor. To commemorate the occasion, I’ve decided to do something I’ve never done before. Something inspiring. Something epic. Something completely, utterly, absolutely, certifiably ridiculous. This July (the 27th to be precise), I’ll be riding my first-ever century. 100 miles. To make this even more of an occasion, I’ve set the goal of raising $10,000 to support the programs at the CT Challenge. Seems like a nice round number – 10 years, 100 miles, $10,000. I’ll be doing this in support of the good people at CT Challenge, who work diligently supporting cancer survivors of all ages in navigating the often rough and murky waters of post-treatment life. 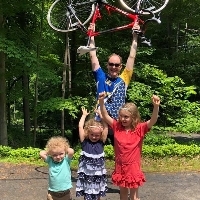 The CT Challenge (CTC) is a game-changing nonprofit organization dedicated to helping the 15.5 million cancer survivors in Connecticut and throughout the U.S. rebuild, improve, and prolong their lives through exercise, nutrition, mind-body health, and community-building support programs.